Here is your chance to finally use the sourdough starter you’ve made! 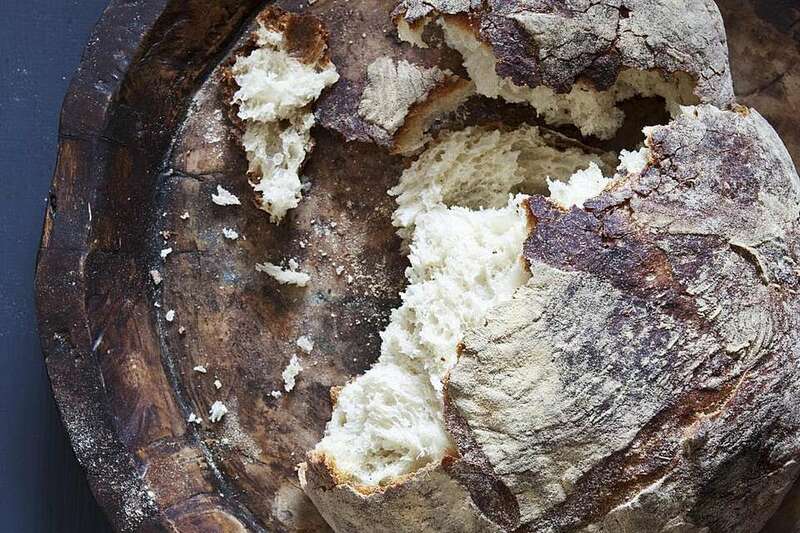 This 1-loaf recipe is a very basic, beginner’s sourdough bread recipe. The crust is soft and chewy and the middle is moist. Great as toast, for making sandwiches, and for dinnertime. In a small saucepan, scald milk and shortening. Set aside and allow to cool until lukewarm. In a large bowl, add sugar and salt. Pour in warm milk and melted shortening. Stir until sugar is dissolved. Add flour, 1/2 cup at a time, until dough is too thick to be mixed with wooden spoon. Turn dough out on floured board and begin to knead for 10 minutes, adding flour when dough gets sticky. Put dough in greased bowl and turn over so that dough top is greased. Cover and let rise in warm place for 90 minutes. Punch down dough. Cover bowl and let rise a second time for 30 minutes. Punch down dough. Turn onto board and knead for about 3 minutes. Shape dough into a round loaf. Place on greased baking sheet. Cover and let rise for 60 minutes or until double in size. Using a sharp knife, slash an X on the bread top. Bake for 40 minutes or until bread sounds hollow when tapped on.